The MagniLink S Monitor connects to any monitor and is ideal for use at home. Read a report or work on scrapbooks. Review a document or share photos. You can even see yourself in “mirror mode”. MagniLink S Monitor comes with an HDMI connector, built-in control panel and uses minimal space. The camera is available in HD or SD resolution. There are many smart accessories to MagniLink S, such as 2-i-1-carrying case and a dockingstation. There’s no ghosting with 60 fps (full digital frames/second). High brightness and contrast (high quality light sensitive lens). HDMI connection and HD/SD progressive high resolution for flicker-free image and sharp edges. The result is an unmatched, superior image. 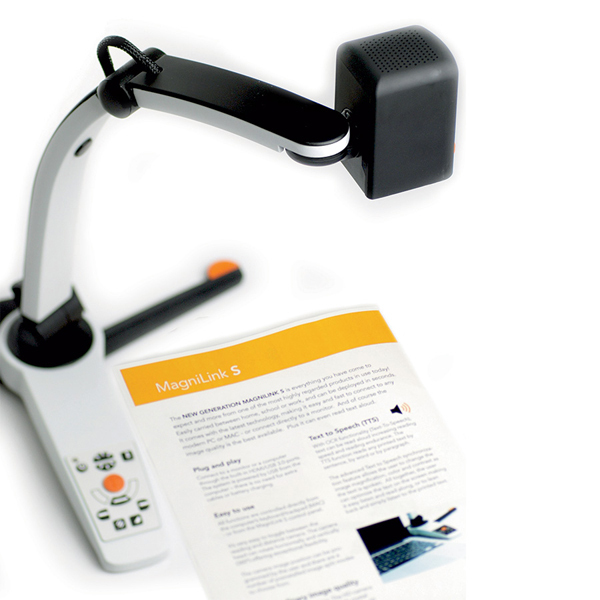 MagniLink S is always accessible; sets-up and is ready to use in virtually seconds. Place the system to the left or the right side - the excellent design makes it flexible and shock resistant. Construction with casted metal and advanced plastic materials throughout, combined with high quality technology, including the camera lens. All parts designed for durability and recyclability in mind. This product was added to our catalog on Wednesday 23 July, 2014.